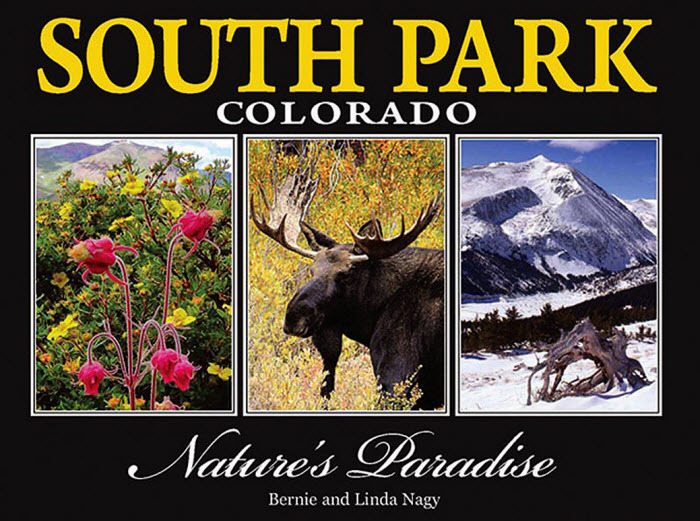 Bernie Nagy and wife, Linda Nagy, are co-authors of “South Park Colorado, Nature’s Paradise”. They received the following awards: 2012 EVVY Award for Travel, 1 st Place; Cover Design, 1 st Place Illustrations, First Place; Layout and Interior Design, 2nd Place; and the Past Presidents Award. The Past Presidents Award is given to the individual entry that receives the highest aggregate average total score of all entries in all categories. The Judges Award is given to an individual entry for outstanding overall technical achievement (cover, layout, editing, illustrations, printing.) You can contact Bernie and Linda Nagy at: nagybernd @yahoo.com or www.HighCountryArtworks.com. I was an entrepreneur, art director and photographer who retired from a catalog mail order/ marketing business in 2003 in Georgia and moved to South Park, Colorado with my wife, Linda. Before publishing my first books, I was a Ski-pro for 6 years in Breckenridge, CO. Besides writing and designing books, I am a correspondent and photographer for the local newspaper. I also serve on the board of trustees for the South Park City Museum in Fairplay, CO. My wife, Linda Nagy, is an artist and graphic designer and is a member of the Woman of Watercolor in Summit County, Colorado. She currently exhibits at the River’s Edge Gallery in Alma, Colorado. She works hand in hand with me on our book projects, especially as editor and also writes articles for the local Park County newspaper and its magazine publications. 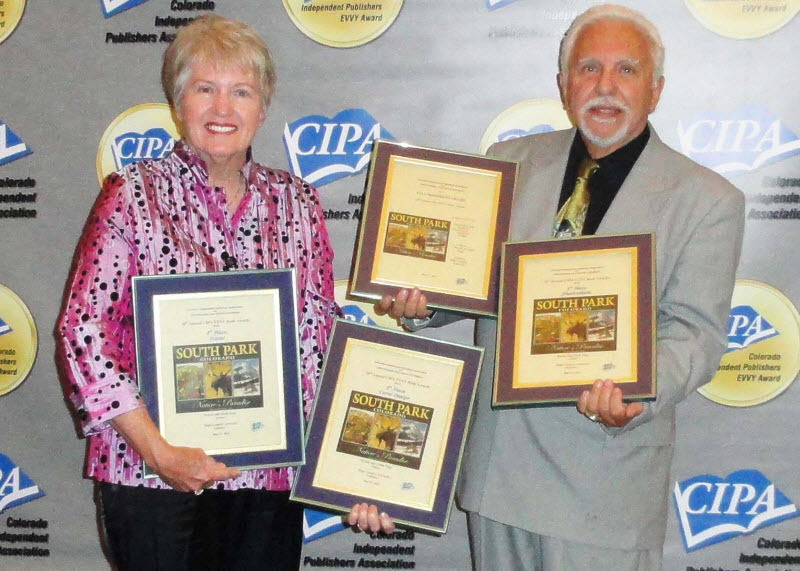 Soon after I received three first place CIPA EVVY awards and an International Book Award for my first coffee table picture book on South Park, Colorado in 2010, I decided with my wife, Linda, to work on a second book in a series. We both felt that there was more to be told of this beautiful Colorado area. In 2010 and 2011 we traveled extensively over the 1,000 square-mile area of South Park with a four-wheel vehicle capturing images through the seasons in the high Country and surrounding mountains. There are over 105 wildflowers featured and identified along with landscapes showing all aspects of South Park in my new book. As with the first book, I wanted to share my experiences and let everyone know there is much more represented by the name “South Park” than a TV comedy series and much more than the casual traveler sees while traveling along the 285 corridor. When we moved to Fairplay in South Park in 2005, we fell in love with the area. I began taking photos of all the events, changes in scenery, animals—all things that typify South Park. Linda and I noticed that there were many history books on South Park, but no photo books of the area. The curator of South Park City suggested, “Why don’t you do a book?” Although my background was in pre-press and my wife was a graphic artist, we didn’t really have the expertise to publish a book and our project was too regional to appeal to a traditional publisher as a money maker. Where would we start? We did some research online and discovered CIPA. The rest is history. What has your experience been with CIPA? or…How has CIPA helped you with that process? From the first meeting we attended with CIPA, we knew that any help we needed would be available. After being in a catalog mail order- direct marketing business where fellow businesses were secretive and not willing to share information, we were amazed at how readily members of CIPA were willing to share experiences and information. From past and present officers, suppliers, and fellow authors, we found answers at every step of the way in producing our first book. CIPA College was also invaluable. What’s next for you and Linda? Of course now we need to market and promote our two books, but we have more ideas in the works. There will be a third book in the series on South Park featuring a pictorial history through time on all of Park County, Colorado. Also, Linda has become quite knowledgeable on wildflowers after researching our second book, so a Rocky Mountain Wildflower book is planned that will feature clear photos and concise information at one’s fingertips. We plan to have them published within the next two years. Colorado’s South Park, High Country Paradise and South Park, Colorado, Nature’s Paradise books are available through our website: www.HighCountryArtworks.com and through www.Amazon.com. The books are also available in Barnes and Noble stores in Denver as well as The Wildlife Experience, Denver Botanic Gardens, Red Rock Welcome Center, numerous retail stores throughout the Front Range and along the 285 Corridor from Conifer to Fairplay. A list of some of the retailers is on our website. Linda and I would like to thank CIPA for the awards we have received and we will continue to strive to improve with each future publication. Our thanks too many of the CIPA expert-pros who gave us valuable ideas for making our project happened. Especially to Mike Daniels for his input and Four Colour Press for making the actual printing process go so smoothly. With my background in graphic arts and printing, I recognize quality work and that’s what Linda and I received. For all of those CIPA members who are still working to publish a first book, don’t feel intimidated or overwhelmed. Believe in yourself but when you need help, keep asking questions until you find the answers.